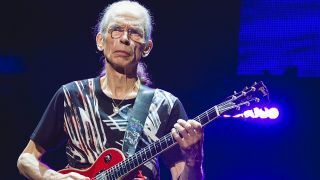 Steve Howe wishes former Yes members Jon Anderson, Trevor Rabin and Rick Wakeman good luck in their new project, he’s said. Anderson Rabin Wakeman will commence their first tour in October, performing a set featuring Yes music along with fresh compositions. Meanwhile, Yes are midway through a US tour performing parts of Tales From Topographic Oceans, the full Drama album and more. Howe tells the Oakland Press: “I would say good luck to them, you know? There’s been cover bands our playing Yes, and we’re delighted, really, that there’s more Yes music being out there, getting played. Yes continue on the road without drummer Alan White, who’s recovering from back surgery. Co-founding bassist Chris Squire died last year. Howe says: “There’s nothing bigger than losing Chris,” and adds of White: “He’s been waxing and waning – he’s been improving, but he’s got to take it a bit more easy. Dream The Electric Sleep: "Peter Gabriel is a part of my life." He reflects: “It’s never a cushy ride. Yes used to kid ourselves that we were like an orchestra, that we were based on orchestral thinking. But that’s in fact what it is. “Yes music is bigger than the people who are in Yes. It’s not unscrupulous or vicious – it’s just that we’re determined to be on the leading age.